Much of the media talk about cashless transactions has centred around popular wallets like PayTM. However the fact is that the rural consumer is not well positioned to make use of such wallets since they require the user to have a smartphone and to be able to know how to use it. To include the penetration of banking and cashless transactions, we need to provide rural consumers with platforms that are require minimum investment and easy to use. Ideally, it should be a platform that can be operated by someone with a mere feature phone without using mobile data. Enter the National Unified USSD Platform (NUUP). 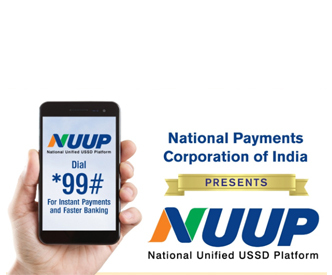 The NUUP is a government supported platform run by NPCI (National Payment Corporation of India) that runs on USSD. You may have heard of this through public advertisements of the *99# program. It can be used by any phone, even without data connectivity NUUP uses USSD which is accessible by all GSM phones. All consumers are automatically registered for this service, hence this service is “live” for every GSM phone in the country with an active phone connection. Don’t know English. Doesn’t matter. It is accessible across 11 Indian languages *99# default language is English, but there are 11 other Indian languages that can be invoked. For example for Hindi you need to dial *99*22#, for Tamil *99*23# and so on. Non-English NUUP session however limit the number of services, and right now one can access the following three services: Balance Enquiry, Mini Statement, Fund Transfer using IFSC and A/C No. It is real-time and works 24/7 even on holidays Unlike NEFT or RTGS, the NUUP is always on and transfers are real-time and can be carried out any day of the year. It requires your mobile phone to be linked with your account/s The only requirement is that your mobile phone number should be linked with your savings account. If you have not linked it, you need to contact your bank and get it linked. Apart from this requirement, no separate registration is required. For example, this is quite separate and not to be confused with your bank’s Internet or Mobile banking services. You can make cash transfers using NUUP What is less known is that besides allowing users to carry out non-financial services like checking your bank account balance, NUUP also allows users to transfer funds across accounts. There are three ways to transfer funds: one is through MMID, the second is using Aadhar Number and the third is using the traditional Account Number/IFSC Code. The NUUP also allows you to view your MMID and MPIN in case you do not have them handy at the time of transaction. You can transfer money up to Rs. 5000 per day The current limit imposed by RBI on NUUP cash transfer is Rs. 5000 per transaction.